Hello friend, I have come here for your Networking basic knowledge which is a very interesting topic, then you can read Networking Basic Knowledge topic and go through some basic things about networking. DHCP—Dynamic Host Configuration ProtocolIt assigns IP addresses to client devices, such as desktop computers, laptops, and phones, when they are plugged into Ethernet or connect to Wireless networks. Ethernet—A type of networking protocol—it defines the types of cables and connections that are used to wire computers, switches, and routers together. Most often Ethernet cabling is Category 5 or 6, made up of twisted pair wiring similar to phone cables. Hub— A network device that repeats the traffic it receives to all connected devices. 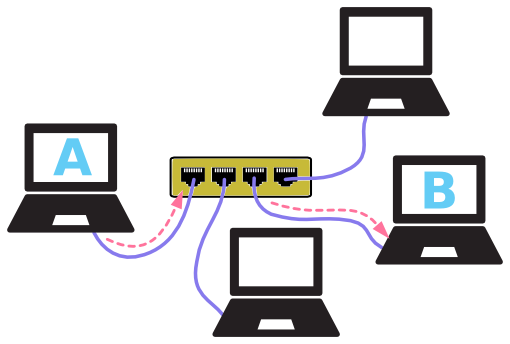 Switch—A network device that sends traffic it receives to a specific connected device, such as a single desktop computer or laptop. Router—A network device that can bridge between different networks, determine what traffic can pass between them, and perform other functions on a network, such as assigning IP addresses. Firewall—A function typically performed by routers, this filters traffic between networks and can protect them from interference or attacks.